Waiting on you!! Located on Scenic Highway 30A, about five miles west of quaint and popular Seaside, this Gulf Place, one bedroom, second floor, condo provides you with a great view of the ocean and sugar white sandy beaches of Santa Rosa Beach, Fl. Perfect for a romantic beach retreat or family vacation. There are bunk beds in the hallway which are great for children. No need to put everything in a car and drive to a public beach when the beach is directly across the street from you. Great location! Our kitchen is fully equipped, we have plenty of cabinet storage, tile thru out and a breakfast bar. We hope that you will find our unit comfortably decorated. You may enjoy the convenience of on-site bike rentals, restaurants (SEE MAP BELOW), pharmacy, cool shops, and an outdoor amphitheater with seasonal music, movie offerings, featured artists and free community events & festivals. Our guest have access to three pools/two there is a pool/hot tub located in front of the Cabanas building and the other at the Caribbean, which is next door. The third pool is behind the town homes on your way to the tennis courts towards the back of the property, closest to 393, the court are free to guest, first come, first serve. Only 7 miles east to Destin's great restaurants and shopping....yet a step back from all the hustle & bustle of the traffic, high-rises and crowded beaches. You will be approx. 75 yards from Santa Rosa's beautiful white sandy beaches. You can also enjoy the community feel by taking a walk or renting a bike and riding down the 18 mile stretch of bike path that is populated with numerous State Parks, Nature Trails & Coastal Dune Lakes all along the Scenic 30A corridor. We hope that we have given you enough information, for decision making purposes, and when making your choice for the beach it will be at Gulf Place Cabanas, Unit 210. Our unit is well furnished and clean so when you come to the beach for an extended stay, you will have all the comforts of home. There is no other place like 30-A!! The Nash family invites you and your friends to please come down and see the emerald green waters of the Gulf Coast. It is one of the most beautiful stretches of beach in America. We look forward to having you as our guest, if you enjoyed yourself please share our vrbo number 30576 with a friend. Second Floor Unit, perfect for children, you can walk down instead of using the elevator. Gulf Place is located at Hwy. 393 and 30-A, great place for your family vacation, beautiful beaches, great food, walk about area. We love the area and 30A is off the beaten path of traffic. You can walk across the street to the beach and watch the sunset. There is a view of the ocean from the deck of the condominium. It is very relaxing and quiet. From the balcony you can see the water, we have a lovely view. Please do not leave the sliding glass door open when running the AC, this will cause the unit to freeze. YOU will have no cool air, in the event maintenance has to be called for this, guest pays. All bed linens are supplied along with linens for pull out bed in sofa. Washers are located on each floor, by the elevator. You will need to bring your own detergent and fabric softener. Dryers are located on each floor by the elevator. All bath towels are supplied including beach towels; PLEASE PLEASE PLEASE shake sand out of towels before you wash or dry them. Please DO NOT take linens to the beach/pool. carts are located in front of elevator for your convenience in carrying your belongings to your unit. Tons of storage in kitchen. We have added the cabinetry for your convenience. Cable is provided by Mediacom. Large balcony. Please do not hang towels over the rail on balcony, this is posted in the elevator as a rule for all. There is a towel rack available for you or you may hang towels over the chairs. Golf is available at several golf courses. 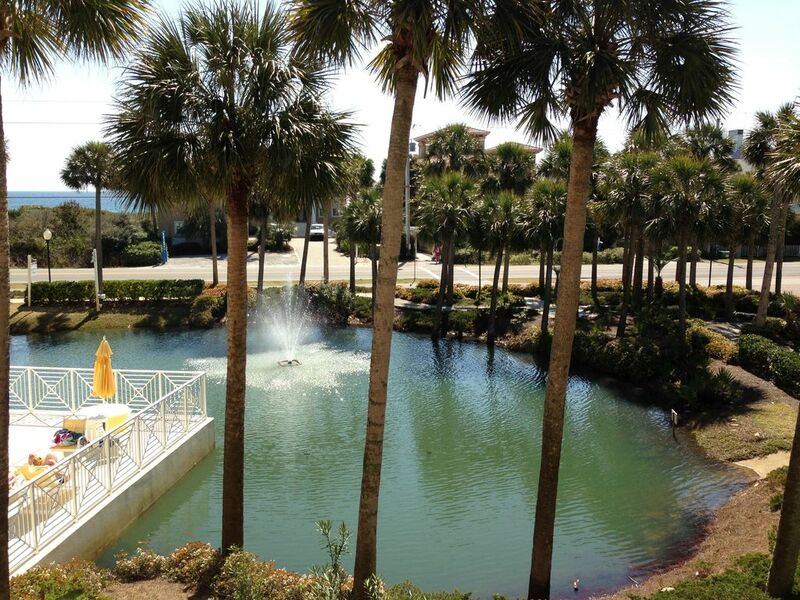 Pool for Cabanas is located directly in front of building facing 30A. There is also a pool at the Caribbean which is right next door. I would love to give this great condo a poor review to keep this little secret to ourselves., but the unit and location were both awesome. The condo was in excellent and clean condition. Plenty of space for two adults or two adults and two children. Judy, the owner, was so nice and accommodating. Beautiful view from the balcony and easy walk to the beach. So many restaurants, shops, etc in walking distance you never have to drive anywhere. We can’t wait to return. We were so sad to leave. Thanks Judy! My husband and I had a wonderful relaxing stay at this pristine condo. The location was ideal for unwinding. We walked along the beautiful expanse of beach (which is only steps from the condo) every morning and evening and ended each evening with a glass of wine in the hot tub. The shops and restaurants all within walking distance were so convenient and Judy was so welcoming and accommodating, it was exactly what we were looking for! Thanks Judy! This place really fit the bill for us. It was nicely furnished and well-equipped with everything you might need. The location is great with many restaurants in walking distance, the beach is literally right across the street about 50 yards away. It's very convenient to have the second 1/2 bath - even for a couple. We were former owners in Gulf Place and our visit in the unit reminded me of how much I miss it! You will not be disappointed, and the owner Judy is very responsive and accommodating. We will be back! Thank you Stan for the great comments. It is always a pleasure to help accommodate someone that has owned in our area before. Please keep our vrbo numbers 30576 and 864639, get in touch with us again real soon. We really enjoyed this condo! Its the perfect size for a couple. We love the fact that we could walk to restaurants/bars and had a variety (all tasty) to choose from. Fun shops as well and wonderful spa (ask for James). The beach is perfect walking distance. We hope to stay again next year! Than you Kristi, makes up feel so good when people have a great time visiting Gulf Place. It is the perfect place to park the car and not go anywhere because everything is around you. We hope you hear from you again. Perfect for families - everything was convenient! My wife and 2 daughters stayed here for a week, and when we decided to extend our stay, Judy was more than accommodating. The location was perfect - convenient to the beach, shops, restaurants, you name it. We barely had to get in the car once we parked it. Definitely a great spot and we will definitely be considering a return next year. Thanks for your get review of our property. The fact that you and your family had a wonderful time could mean that you went "coastal", not getting in your car to drive all over surrounding areas, walking to eat and enjoying all the activities and beach. You found out why we chose Gulf Place, it's so nice to share. We absolutely loved the condo and our time in Santa Rosa! We loved staying at Gulf Place Cabanas! The condo had everything we needed and was clean and beautifully decorated. The condo was so close to the beach and accessible to everything. We were able to walk to dinner many nights and enjoyed live music on the green and the other amenities Gulf Place has to offer. Judy was so kind and helpful in giving us recommendations for dinner in the area and was quick to respond back when we had any questions. Owner has the right to raise the rate on holiday weekends. Owner has the right to change the rate when a deposit is not received. Every reservation will be charged a cleaning fee, normal rate is $100.00. Long term rate is higher depending on length of stay.